Who has not dreamed of becoming a royal cook, and preparing the finest dishes with the best ingredients? For this, win the favors of all the royal family by respecting the order of the banquet menus given in their honor. 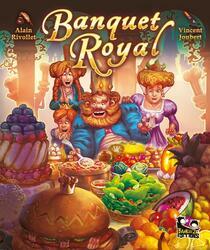 Players will place Cooking Dishes or their Toques on the Royal Banquet table. By respecting the good order of the Menus, they will earn Royal Points.